Business Korea reports that LG Display is in talks with Google regarding a large investment in LGD's OLED facilities towards the development and production of VR displays. BK says the investment will amount of hundreds of billions of Won (equivalent to hundreds of millions USD). The report is somewhat confusing, though. On the one had it says that Google is interested in OLED microdisplays, and on the other it says that LG will produce the displays in its existing flexible AMOLED lines, which use a different technology than microdisplays (which are produced on Silicon). LGD and Google seem to have started discussion at around April 2017, when it was reported that Google wants to invest $872 million in LGD to help secure flexible OLEDs for its next-gen Pixel phone. Earlier this week LGD confirmed it is talking to strategic partners regarding possible financing of its ambitious OLED expansion plans. Other reports today suggested that Apple will invest $2.7 billion in LGD, but it is likely that LGD is indeed with talks with Google as well. If we assume Google and LGD are indeed talking, there are several possibilities. The most likely scenario is that Google wants to secure flexible OLED capacity for next-generation phones. Another option is for Google to acquire flexible smartphone-sized OLEDs for VR headsets. 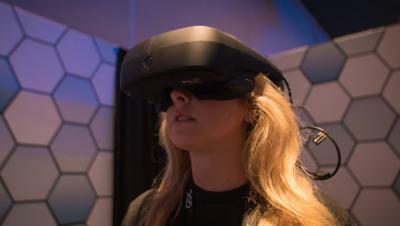 In March 2017 LG announced that it is developing a new VR headset uses dual 3.64" 1440x1280 (529 PPI) 90Hz OLED displays, produced by LG Display. So LGD is indeed developing VR-ready AMOLEDs. In May 2017 Google's VR vice president, Clay Bavor, revealed that Google has partnered with "one of the leading OLED makers" on a secret project to develop a high-end VR display. The OLED display will support a resolution of 20 million pixels per eye. It is possible indeed that LGD is the mysterious OLED maker. Another option is that LGD is indeed developing an OLED microdisplay for VR applications. Microdisplays are very interesting for VR, as these are high quality displays with a small footprint and high efficiencies - which means that VR headsets based on microdisplays will be lighter, smaller, more efficient and with better performance compared to current HMDs that use smartphone-sized displays. A report from 2016 (also from Business Korea, by the way), claimed that LGD is looking into a dedicated OLED-on-silicon production line for VR microdisplays. This was the first indication we ever had that LGD is developing such technology. The same reported suggested that SDC is also developing OLED Microdisplays - based on flexible OLEDs though using the same process used to create high-res smartphone displays. OLED Microdisplays are gaining in popularity. Existing players such as eMagin, MicroOLED, Sony and others are aiming to enter the consumer market, while other companies are entering the field - including BOE (in collaboration with OLiGHTEK) and Kopin. A post on our discussion boards suggests that eMagin and LGD may be partnering on OLED microdisplay production. As eMagin's ex business-development VP is now working on VR in Google, this could form a potential trio indeed. Came across this article from 3/16 . To my knowledge silicon wafers are only used for micro displays . LG Display is focusing on ways to replace current plastics and glass with silicon wafers. Silicon wafers are used as raw materials for semiconductors. They are more expensive than plastics or glass but realize more precise picture qualities. It is known that LG Display is conducting a feasibility study on the construction of a silicon wafer-based VR-only production line in a new OLED factory under construction in Gumi City, North Gyeongsang Province. Google to use MicroOLED's OLED microdisplays in next-gen Google Glass? Google to use OLED panels in its next-gen Google Glass HMDs?